PuffinPlot is a user-friendly, cross-platform program which analyses and plots palaeomagnetic data. It provides several plot types and analysis functions commonly used in palaeomagnetism, user-configurable graph layout, CSV data export, and SVG and PDF graph export. It has facilities for both interactive and bulk analysis, and can also be controlled and extended using any JVM-based scripting language (including Python). PuffinPlot is written in Java. 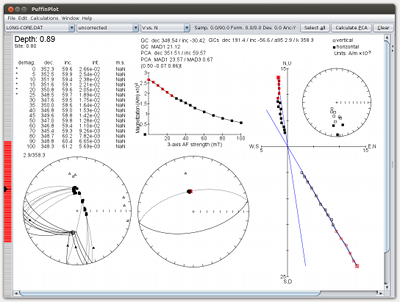 The latest PuffinPlot software release is version 1.03 (23 April 2015). The release of version 1.4 is planned for the near future; in the meantime, there may be occasional unofficial interim releases available here. You can download the latest official release of the PuffinPlot program and its documentation – suitable for any operating system with Java 7 or later – by clicking on this link. Downloads are also available for previous versions of PuffinPlot. 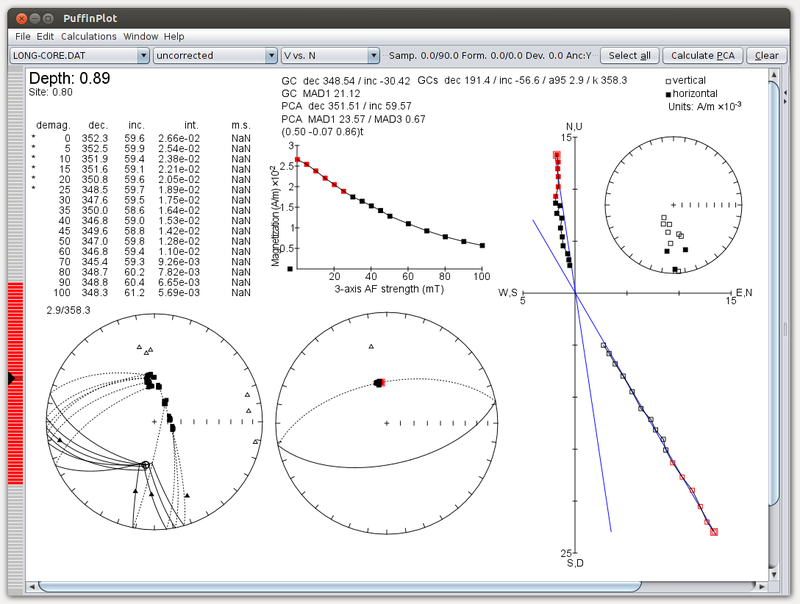 A screenshot of PuffinPlot version 1.02 analysing long core data. Click on the image for a larger version. Note that the analysis is composed to show off various capabilities of the program, and is not intended to be palaeomagnetically plausible! Lurcock, P. C. and G. S. Wilson (2012), PuffinPlot: A versatile, user-friendly program for paleomagnetic analysis, Geochemistry, Geophysics, Geosystems, 13, Q06Z45, doi:10.1029/2012GC004098. Follow this link for the full article text and downloadable citation data. PuffinPlot's issue tracker, with details of known bugs and requested features, is available online. The online display is read-only; to report a new bug or request a feature, please email puffinplot@gmail.com . PuffinPlot is developed by Pontus Lurcock <puffinplot@gmail.com>. Comments and questions are always welcome.